Party mix and cheese balls: kitsch or classic? 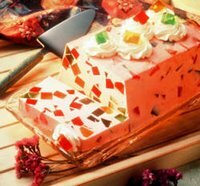 Two holiday classics from the midcentury era — Crown Jewel Dessert (also known as Broken Window Glass Cake) and Green Bean Casserole — turn 50 this year. The sparkly dessert from Jell-O features cubes of green, orange and red gelatin, stirred into a mixture of syrupy red gelatin and whipped topping before being chilled again for serving in squares with more whipped topping. The green bean bake is notable for its simplicity: green beans, mushroom soup, milk, pepper, french-fried onions. (The Campbell's recipe adds soy sauce.) You can find it on every can of French's french fried onions, or go to www.frenchs.com for the original recipe and variations.